This cell is for sale on eBay right now. But... isn't there something odd about it? Donald is dressed like he's working as a blacksmith. 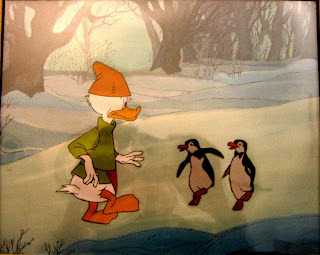 But what is he doing in a winterlandscape with two penguins that looks like they've escaped from Mary Poppins? Edit: Donald is taken from "Steel and America" from 1966. Had never heard about that one before Didier posted a sample over at his Disney History blog. See link to the right. I have a bunch of very rare drawings by various Disney comics artists (Taliaferro, Gonzales, Gottfredson etc.) that I had never seen before. They come from the Disney archives. If you wish, I could send some of those to you that you can add to your blog. (In two weeks, I could scan them). 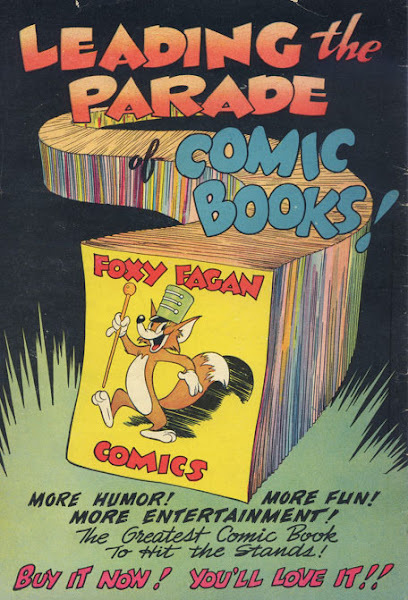 Is this the set of copies of promotional pieces made for newspapers etc including one black & white copy of a drawing by Gottfredson made for George while hospitalized? There's also a drawing made for NCS etc. In that case I got that set too, from you-know-who. But I don't know if I can run them here on the blog without getting him in trouble.